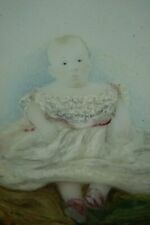 Here we have a stunning miniature portrait of a baby in watercolour painted on Milk Glass. Size: 8.2 cm in wide x 10.7 cm long. She is wearing a pretty White Dress with a Pink sash around her waist and red shoes. RARE OPPORTUNITY TO ACQUIRE A FINE ORIGINAL ANTIQUE LATE C18th GEORGIAN PORTRAIT MINIATURE LINE ENGRAVING ON WOVE PAPER DATING TO 1788. 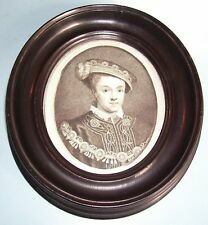 THE ENGRAVING DEPICTS KING EDWARD VI (1537-1533) ONLY LEGITIMATE SON OF KING HENRY VIII BY HIS THIRD WIFE JANE SEYMOUR. "Laughing Child" (l'Enfant Rieur) original gilt bronze sculpture on onyx base made by Jean Antoine Injalbert (1845-1933). It's signed A Injalbert with " Modèle Original" hand writing and Siot Paris mark. Almost a "trademark" of this renown Artist is the flash of RED COLOR from the balloon. The artist's signature on the lower left reads: Parthesius. "Charles Parthesius", the signatory of this work, is now deceased. Bill, one of the directors was joined by his son, Dan, in 2012. The art in our online gallery has been handpicked by our team of highly qualified art historians. Includes a Certificate of Authenticity. 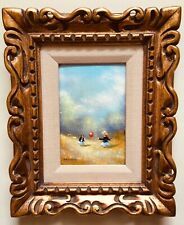 VOLENDAM, HOLLAND Original Vintage Miniature Paintings. Girl & Boy. Signed. Lovely pair of miniature oil/acrylic? paintings in matching frames from VOLENDAM, Holland. Signed by artist J. Wolde. Depiction of Dutch girl with a doll, and a Dutch boy with a toy boat both with wooden clogs and traditional dress. Each measures 2.5 inches by 4 inches. From immaculate, pet-free, and smoke-free home. Creation Year: ca. 1850. Style: Portrait Miniatures. CHILDREN PORTRAIT. LITTLE GIRL. Creator:French School. Nationality: French. FINE PEN & INK DRAWING WILLIAM HAGUE. A very nice caricature by one of Britain's most celebratedpolitical caricaturists. NICHOLAS GARLAND (BORN 1935). Overseas Buers. FINE PEN & INK CARICATURE DRAWING OF TONY BLAIR. A very caricature by one of Britain's most celebratedpolitical caricaturists. NICHOLAS GARLAND (BORN 1935). Overseas Buers. Vintage Brass or Bronze Figure Boy w/ Well Buckets, marble base 4"
I am selling the Vintage Brass or Bronze Figure. This figure appears to be of a boy carrying a stick with 2 buckets of water. The figure is about 4" tall and the base is 2 1/4" square. The figure is made of metal. I am not sure if it is brass or bronze. The base is made out of solid marble. This figure is vintage, but in good shape with no chips, cracks, or damage. There is a little bit of polish on it (in the crevices), so it could be cleaned up a bit. Featuring works by Charles Frederick Buckley (1812-1869), John Edmund Buckley (1820-1884), W. R Buckley and others. A very fine circular watercolour study of a sleeping baby. Charles Frederick Buckley was likely born in Cork, Ireland in 1812 and died in London in 1869. This work is hand painted on fabric by the artist and then a trapunto technique is done. This original art is the nicest one I have seen from Nancy Stillwagon. (Good to Very Good). Unless stated otherwise. (E. Binet de Quehelec. E. Binet de Quehelec whose religious paintings are to see in several French churches (see our image nr.8). She was born in 1808 in Paris as a daughter of a mathematician and from 1808 teacher at the Parisian Ecole Politechnique, Paul Rene Binet (1779-1858; older brother of celebrated mathematician Jacques Philippe Marie Binet)) and his wife Marie Jeanne Perrine Denise Jehanne de Quehelec (1784-?). Little Girl w/ Braids. Matted to a 2.5" circle. The painting is in very fine, stable condition with no obvious loss or discoloration and the technique is sophisticated and accomplished. I see no signature. Collection: Winter Wonderland Friends. Production Status: Retired. Production Date: 2003. It is signed G. Siccardi. Giuseppe Siccardi ( Italian. ). Original miniature oil on ivorine painting of a girl with hat. Description: Very rare print. State: Second state of 2. Ref: Hollstein 13. Artists and Engravers: Made by 'Christoph Metzger' after own design. Christoph Metzger (active ca. 1659-1680) originated from Nurnberg. He worked in Frankfurt am Main as engraver and painter. The subject matter for all 3 of these lovely simple drawings is children. Hand-coloring is also known as hand painting or overpainting. Truly Collector's Choice. Excellent for Collection. Grandreams famous for their annuals and children's books in the 1990's., with tissue cover and publishers pencil marks. Rare Original watercolour Bright and colourful original children's illustration. Creation Year: ca 1790. Technique: watercolor on paper. Portrait of a 14-to-16-year-old French girl dressed in fashion of ca. 1780. Style: Portrait miniatures. He had a very important collection of paintings and works of art from the Napoleonic Epoch (see our last image). FIRST LESSON - PAINTING SIZE: APPROX. LOW STARTING PRICE. THIS IS A BARGAIN PRICE FOR SUCH A HIGH QUALITY PRODUCT! Creator: A. H. Dole. Creation Year: 1906. Technique: watercolor on organic wafer. Style: Portrait Miniatures. CHILDREN PORTRAIT. Mlle Elisa Apollina Deharme "Portrait of a boy", from Bernard-Franck collection! She was a pupil of Nicolas Jacques, lived in Paris, and exhibited many of her miniatures at the Salon of Paris from 1834 to 1868. Among her sitters were Napoleon III and the Empress Eugenie. Schidlof writes, "she was a clever miniaturist, whose works are well drawn and have pleasant colours". Very high quality miniature on organic wafer with portrait of a 4-5-year-old noble boy from the late Georgian period (1810-1815). In this case we would be dealing with Londson miniaturist Richard (or Robert) Hunt, who exhibited in the Society of Artists in 1789/90 and at the London Royal Academy in1802-1842. An opulent lace-collar and blue jacket only adds to this one's elegance. Signed by the artist, M. Puisov, I believe but very difficult to read. You can try to make it out, found at about the 8 0'clock position on the wafer, captured in the scan of the painting. A delicate pencil sketch capturing a young child in her mother's arms. Well presented in a cream card mount. View in Room. Size: 6.9 x 13.7cm (2.7" x 5.4"). Bill, one of the directors was joined by his son, Dan, in 2012. Beautiful wood art signed by Deldee. Lovely little wooden block. It features a little boy holding a large sunflower. This delightful watercolor and gouache with graphite under-drawing dates ca. 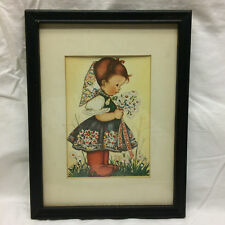 1905 and depicts a flower baby or similar with blossom-inspired beribboned bonnet. The artwork is a-ok.